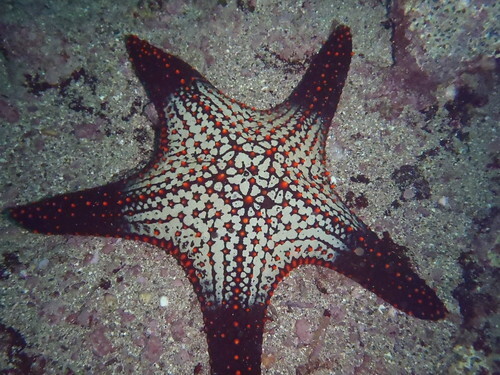 The Echinoblog: Sea Stars/Starfish/Estrella de Mar of the tropical East Pacific- Baja California, Mexico, etc.! Some cool Flickr Pix! 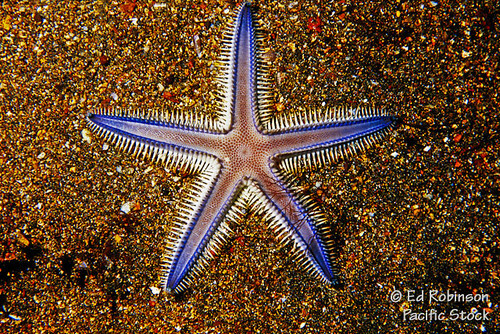 Sea Stars/Starfish/Estrella de Mar of the tropical East Pacific- Baja California, Mexico, etc.! Some cool Flickr Pix! 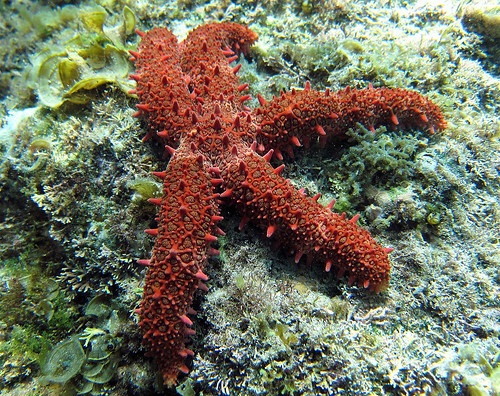 The tropical East Pacific region, including Baja California/Mexico, Panama, to Ecuador and the Galapagos has some of the most unique, diverse and GORGEOUS starfish species anywhere in the world. This area is also interesting for studies of biogeography and evolution as the "middle ground" between the highly diverse Indo-Pacific region and the tropical Atlantic. 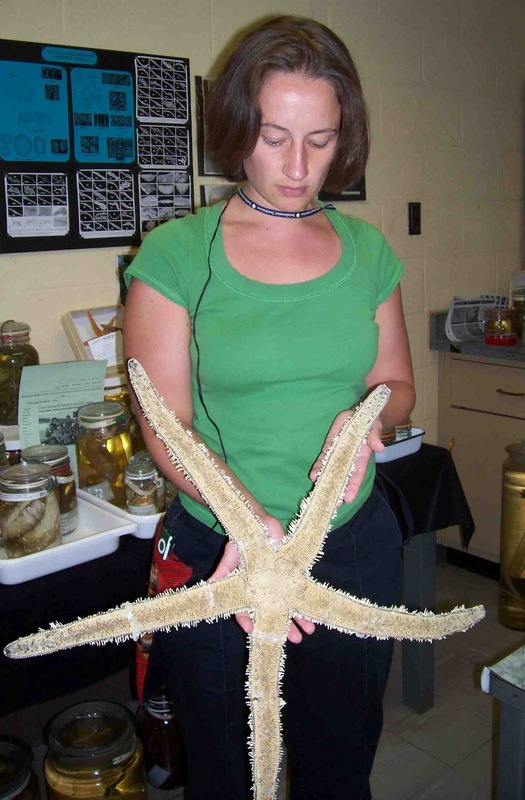 One cool resource for this area is the Gulf of California Invertebrates Database run by the Center for Sonoran Desert Studies at the Arizona-Sonora Desert Museum. Go check it out! Image by cam17 from the Galapagos. This next pic is something special! You can probably not see this anywhere but in the Panama area (where there are both Atlantic and Pacific coasts)!! The yellowish-orangish individual on the left? 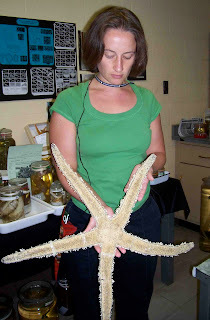 is the tropical ATLANTIC Oreaster reticulatus. 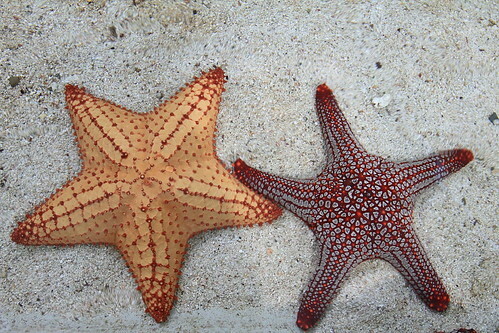 Vs. the deep red individual on the right which is the tropical PACIFIC Pentaceraster cumingi (also called Oreaster occidentalis in the past). They are closely related.. and possibly sister-species separated by the Panamanian land bridge/isthmus! Another great image by billamp. Pic from off San Carlos Mexico. Close up on Nidorellia. This terrific image by Scott Trageser (NatureStills) shows tiny ophiuroids (possibly Ophiactis?) living on the spines! Not sure, but these might be something new? Pharia pyramidata. Ophidiasteridae. 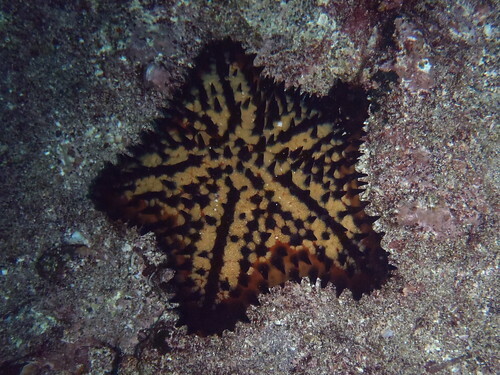 Image by Hawkfish from Cabo Pulmo, Baja California, Mexico. Phataria unifascialis. 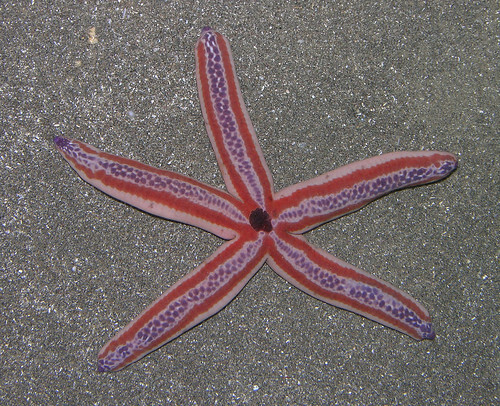 Ophidiasteridae. 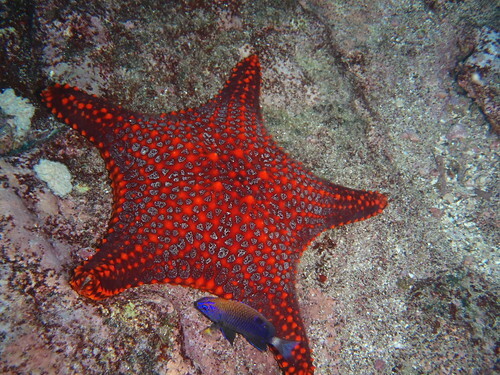 Image by Hawkfish from Cabo Pulmo, Baja California, Mexico. here's a red variant from Panama by colleague Arthur Anker! Mithrodia bradleyi. Mithrodiidae. 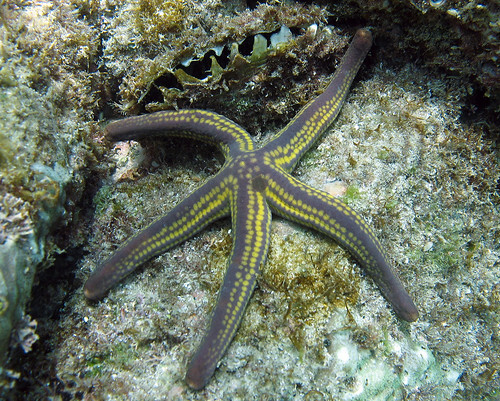 Image by Hawkfish from Cabo Pulmo, Baja California, Mexico. 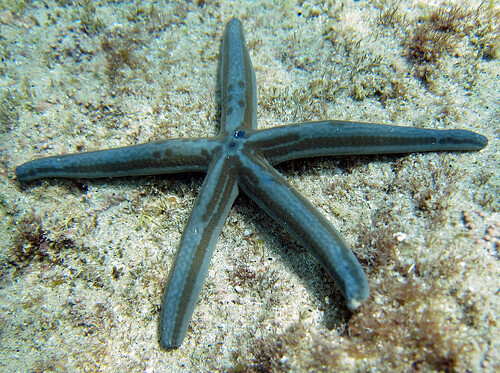 Heliaster kubiniji. Heliasteridae. Image by Sou so-Fine from La Paz, Baja California, Mexico. 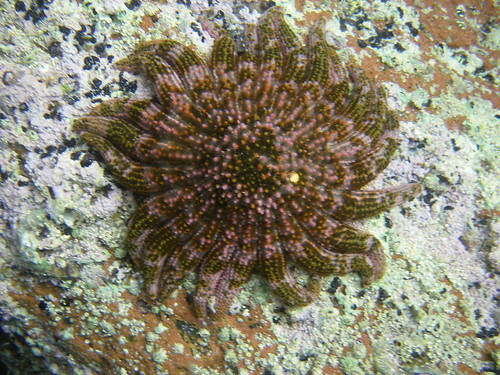 Acanthaster planci. 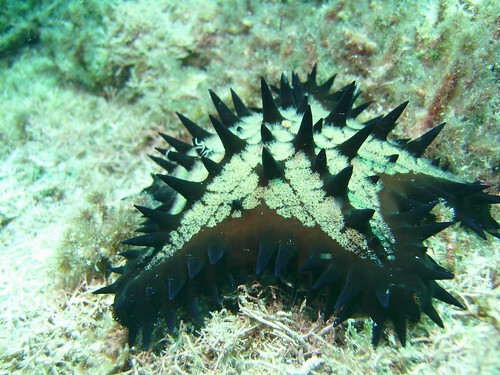 Acanthasteridae. 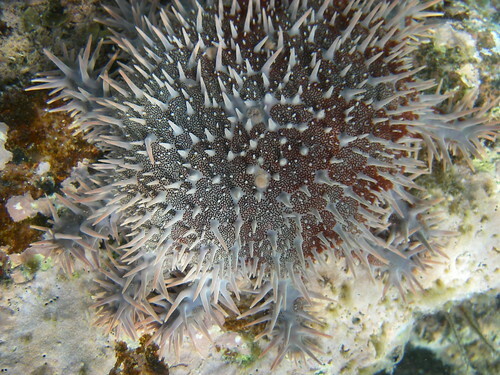 The Crown of Thorns starfish! Image by Sou So Fine. Image from La Paz, Baja California, Mexico. 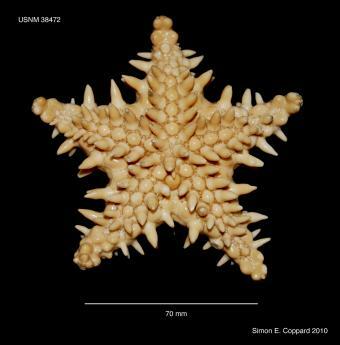 At one time, there was one species of crown-of-thorns starfish which occurred from Baja California to Southern Japan/Hawaii all the way to the east coast of Africa! 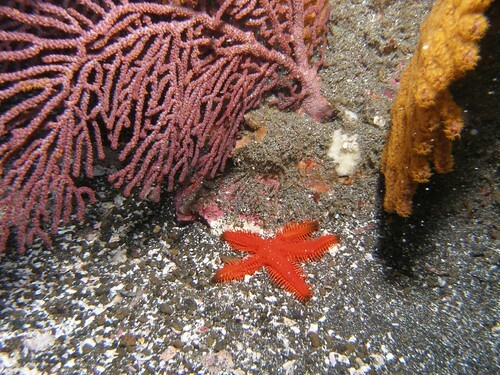 Nowadays, genetics tells us there are likely multiple cryptic species that morphology may or may not be able to distinguish..
hmm..an interesting red Astropecten sp. 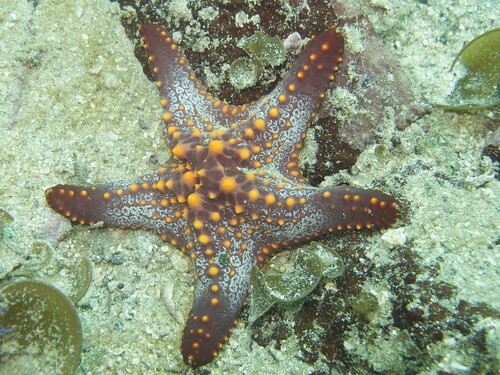 Astropectinidae from Ecuador. Image by altsaint. Here is Amphiaster insignis one of the few members of the family Asterodiscidiae (image from Simon Coppard's "Echinoderms of Panama" Lifedesk. In life these are a brilliant orange.. It's amazing what you can discover for beautiful creatures in nature .. very nice pictures and great description ..